Finally, The Nokia 808 PureView come to Indonesia. 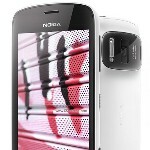 The 41 Megapixels camera phone is available for Pre-Order start from 06-08 June 2012 at Indonesia Cellular Show located at Jakarta Convention Centre. Nokia Indonesia via twitter said that is Limited Edition for Nokia 808 PureView, maybe the quantity is very limited in Indonesia. with Tripod adaptor and HDMI Cable for compliment. So if you want to have this phone, you should pre-order as soon as posible. What does it mean by "LIMITED EDITION"? ?